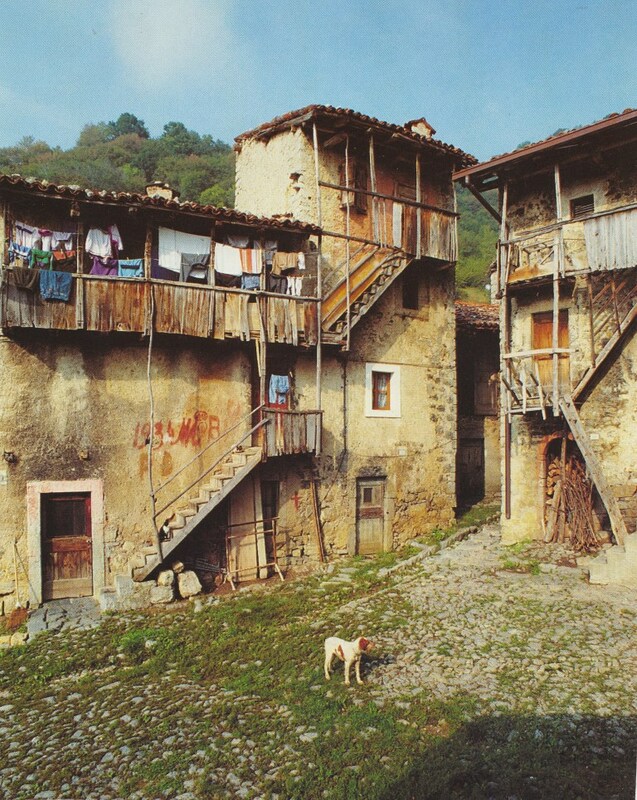 Catremerio is certainly one of the most interesting and beautiful historical centres in Brembilla Valley and it is the destination of many tourists all year long. After the recent restoration in the early 90’s, supported by volunteers, the centre became a symbol and a privileged destination for cultural tourism. 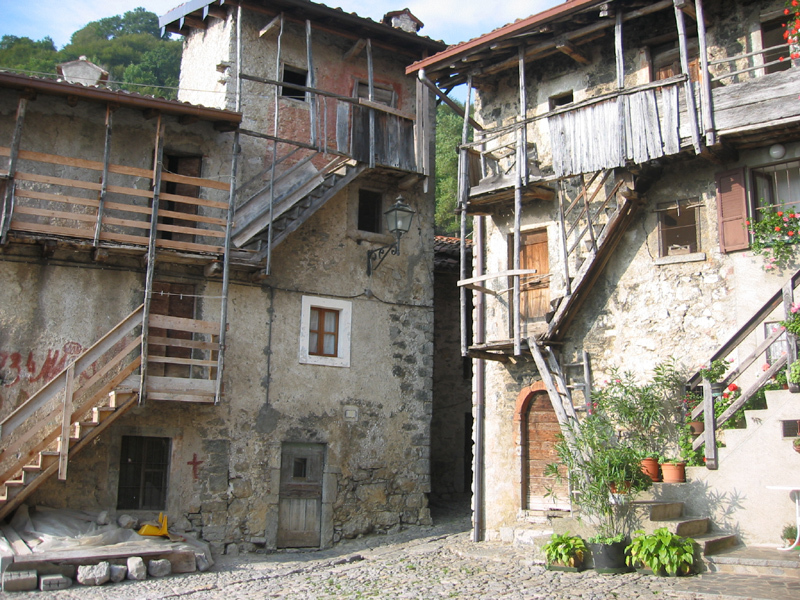 It is possible to observe some features of the rustic mountain centre in Catremerio, with many well kept elements and evidence of the traditional rural activities. The centre shows the typical architectural elements of farm-houses in the sixteenth and seventeenth centuries: vault interiors (silter), wooden balconies that connect houses, tiled chimneys and roofs, drain-pipes in the paving, small votive temples and many other details. Some people still live in these houses and the peasant connotation is still clear, for example in the numerous small stables. Catremerio consists of two distinct quarters: “Catremerio di qua”, where the Sgarbui (lawyers) used to live and “Catremerio di là”, where the Balòss (cunning) used to live, near the small church of Saint Gaetano. In the former, all houses are arranged in a circular pattern and face the small square where you can admire the external wooden stairs and balconies connecting the different buildings. The houses date back to the eighteenth century, you can in fact see some dates engraved on the vaults at the entrance: 1738 and 1754. The peculiar arcade that crosses a house and gives access to the mule-track leading to the other part and the church is also worth a look. On the ground floor of the various houses rooms are “silter”(vault-shaped), used as stables long ago, with stone-floored kitchens next to them. Some of them still have the old fireplace, the ‘pegna’ (stove) and the cupboard. Windows and doors vary in size and lenght, most of them are arch-style. In the middle of the narrow street that crosses Catremerio, there is a small draning channel for roofs that collects water and many fountains and wash-tubs. In the second quarter, you can see the engraved dates 1546 and 1581 on the arcade of some doors and a sixteenth century fresque representing the pity and the crest of the Carminati family; it develops along the mule-track that from the church leads to the graveyard with some original or restored houses. The small church dates back to the beginning of the nineteenth century and lies on a eighteenth century chapel devoted to Saint Gaetano, patron saint of Catremerio. The church has been enlarged several times, then acquiring the current dimension at the beginning of the twentienth century; during these times, the centre counted 310 inhabitants and became an autonomous parish, moving away from Brembilla. Since 1986 the parish of Saint Gaetano in Catremerio has been assembled to Sant'Antonio Abbandonato. The patron saint is celebrated in the first half of August, with masses, processions and celebrations that last three days and are attended by many people and emigrants. Starting from Catremerio on path CAI 596, you can reach the mountain hut of Lupi di Brembilla (1266 m), situated very close to the top of Pizzo Cerro (1285 m). The summit of Pizzo Cerro is a usual destination of many hikers that, besides the beautiful landscape, can enjoy the hospitality of the hut, ideal place to stop and relax during the hike. The hut, managed by the association Lupi di Brembilla, is open on Sundays and offers a very good restaurant. In addition, Catremerio is the starting point to go to the other mountains in the area, like the Castello della Regina (mt.1424) for a two-hours walk, the Corna Camoscera (known as “Còren”), mt.1343, characterised by white vertical walls made of solid limestone stretching for over 200 metres, the Foldone mt. 1502, path CAI 595 and, further, the Sornadello, mt. 1580. Another interesting hike is the one that leads, in less than half an hour, to the peculiar centre of Crosnello, (mt. 1094) small jewel of mountain arhitecture, and to the centre of Sussia di San Pellegrino Terme, which is now uninhabited, with its small church of Saint Michele. You can also go to Catremerio from the centre of Brembilla, starting from the area of Pontelambro and following path CAI 592 B, crossing the areas of Chigavacca, Cerro Foppa, Ca Donzelli, Fienili del Cerro and reaching Catremerio di Là.